Over on the Oak House Studio blog and facebook the new March challenge is up with the theme FLORALS - so anything floral using any Oak House Studio product. Full details can be found HERE. So here's my tag for starters using a variety of Oak House Studio stamps - ATC Linen Background, Small Sunflower, Live the Life and the English Summer Garden text. The tag background is coloured with Midnight, Sea Green and Powder Blue Pigments Ink Pads - swiped on a messy mat, spritzed with water and picked up with the tag in exactly the same way as with Distress Inks. The Linen is stamped with Midnight. 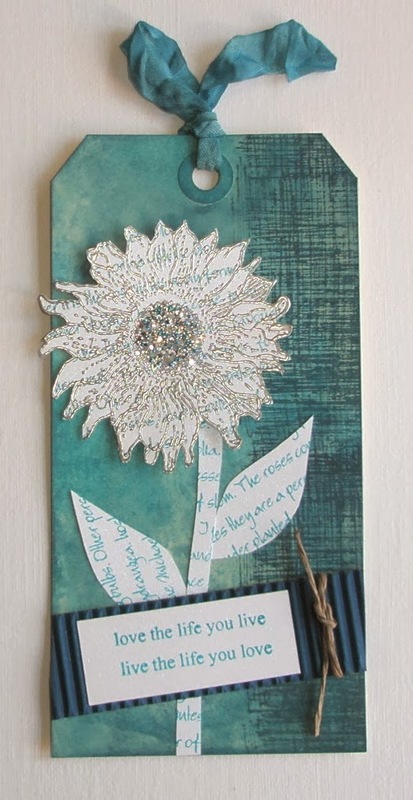 The text was stamped with Sea Green, overstamped with the Sunflower and embossed with silver embossing powder. I've added some Beadazzles to the centre and hand cut the stem and leaves. All spray inks, pigments ink pads, embossing powder and stamps are from Oak House Studio. Why not join in the fun - there is a prize to be won. A brand new stamp and I don't even know what it is! !